Combined threading tool gauge for ACME 14 ½° and angular threads 47 ½°, 55°, 60°. WELD FILLET GAUGEA versatile tool for the use of welding operator. The tool can be used with ease for weld joint preparatory functions as well as for checking of the weld joint. The tool combines a bore gauge, angle gauge, depth gauge & weld height gauge. The tool is made in stainless steel with polish finish. 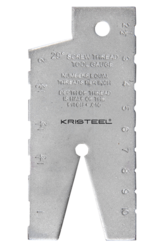 LEAF TYPE WELD GAUGE (7 LEAVES)This rugged gauge is fabricated in stainless steel & allows fast, accurate measurement of 11 fillet weld sizes: 1/8, 3/16, 1/4, 5/16, 3/8, 7/16'/ , 5/8, 3/4, 7/8, and 1" and their metric equivalent. Also used to 2 determine weld size, either concave or convex. 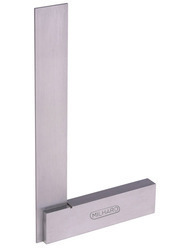 Each blade is made of 1.25" x 4" cold rolled stainless steel to resist rust and bending. The blades are deburred to remove rough edges. 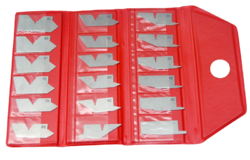 The set of seven blades is packed in a handy 2" x 2.5" pocket case with the user manual attached for easy reference. It is also used to eliminate the major cause of socket weld cracking. This angle gauge having 20 nos levels made in stainless steel hardened & tempered. This gauge is useful for measuring angles 1- 45° can be use for checking shaft dove - tail angle. This gauge is useful in tool room. Die makers, mould makers & woodworking industry. RADIUS GAUGEConcave and convex blades. With nickel plated case and locking screw, For the checking of sectors of circle. This set is mainly used to check the radius of concave and convex portion of any radial part. This gauge is useful in workshops, general purpose, tool and die makers, woodworking industries, quality department etc. The gauge is packed in PVC pouch with brass handle to hold the leaf while checking. The accuracy of the product is equivalent to international standards. For the measuring of cylindrical bores. This Bore Gauge has 4 blades each marked with graduation of range 1/16" to 1 1/16". The gauge is used to measure internal bore diameter of cylindrical objects. For additional models of bore gauge please turn to page 2/6. For Machinists, Draughtsmen, layout men & other mechanics. This gauge is made of hardened and tempered stainless steel material having a range of 5° to 90° incremental of 5° (total 18 leaves). This gauge can be used to check internal & external angles of any machined part to check dovetail angle of shafts. It is one of the most useful gauges for general purpose fabrication workshop. Tool & Die makers, wood working industry and the quality assurance department to compare angle of any part. All 18 leaves are packed in PVC Pouch. This Hard Chrome Plated Guage is used to measure the ACME Threads for setting of cutting tool. This gauge is used to set the quick change gearbox to required number of threads per inch & also to set Compound rest 14.5° to the right. (half the included thread angle. Looking for kristeel Engineering Gauges ?